If you’ve emerged from the garden to find a minor itch has turned into large welts or if you’ve eaten a bit of food that led to an itchy tingle in your mouth or raised bumps on your skin, you may have experienced one of the unpleasant reactions plants can cause. According to the Mayo Clinic, even slight exposure to an allergy-causing food or plant can trigger an immediate reaction from the body’s immune system. Hives don’t cause harm themselves, but they are a signal to you that your body is trying to fight off an invader and protect you from a potentially dangerous substance. While peanuts are among the best known allergy-causing foods, many other foods can also trigger a reaction. 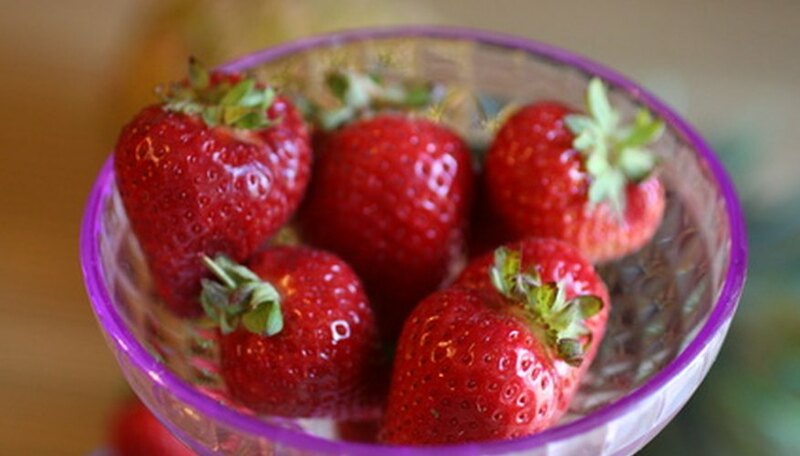 Strawberries promote the formation of histamine in the body. Other berries, tomatoes and nuts--especially tree nuts--commonly cause allergic reactions, including hives. Even onions and garlic may produce hives, which may occur as a single bump but more often appear in groups. Pitcher plant--also known as huntsman’s cup or fly catcher--is sometimes taken as a medicine to treat urinary and digestive tract disorders. According to the University of Michigan Health System, it can cause hives as a side effect. Nettle is another medicinal plant that can cause people to experience hives from use. The American Academy of Dermatology warns that all medicines--even over-the-counter varieties--vitamins and topical applications should be considered as a source of irritation if hives occur. Relief can also be found in the garden. According to the University of Maryland Medical Center, a topical application of peppermint can calm hives and soothe poison ivy reactions because of the menthol it contains. Plants can cause hives through contact with the skin in addition to ingestion. The stem and leaves of stinging nettle have tiny hairs that contain histamines, which can lead to intense itching and the development of hives. Individuals with a history of allergic reactions should cover skin when handling a problem plant and avoid direct contact if the potential for a reaction exists. The Auckland Allergy Clinic warns that contact with plants can cause a problem on the job. Those who work with large quantities of tulip bulbs, lily and hyacinth bulbs frequently find they develop dermatitis and hives related to handling the bulbs. Protective clothing and washing the area of contact as soon as possible help reduce exposure and the subsequent reaction. Those with pollen allergies may develop hives as a reaction to some plants and foods. The Mayo Clinic describes this as cross-reactivity, in which a fruit or vegetable may trigger a flare up, usually felt as a tingle or itch in the mouth. Even bananas and apples can cause a reaction. People who work in the garden near stinging insects that visit plants to feed or pollinate may also react to an unnoticed sting by developing hives.